Preparing for more Smiles per Gallon. When I woke up this morning I understood that it'll be Soft Sunday in the Sun today. Shortly after it became clear that it was one of these days when outdoor is best from inside. Cold (-7degC/19degF) and windy. The only thing that the sun could bring was some charm and bright light. Inside the warm Salt Slush workshop all kinds of activities were ongoing. 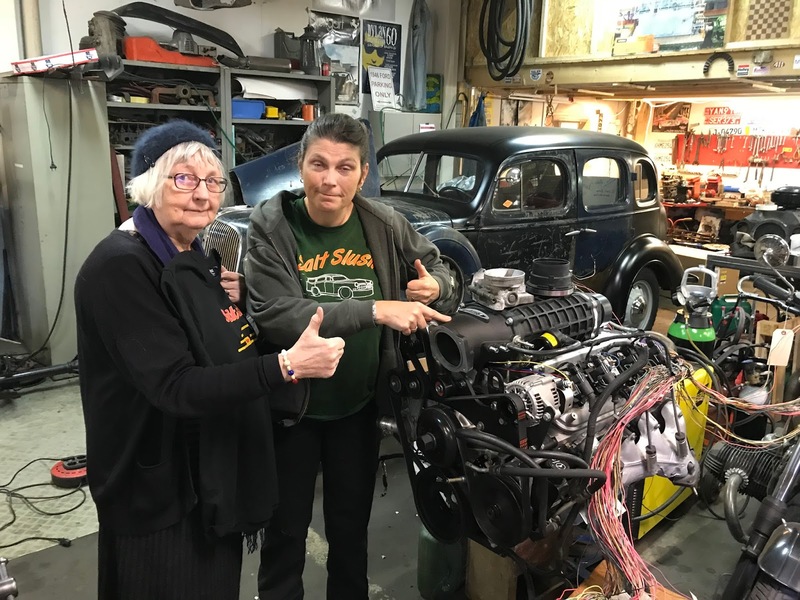 Anders is working hard to make his LS engine take-out + Magnuson Supercharger project come true. 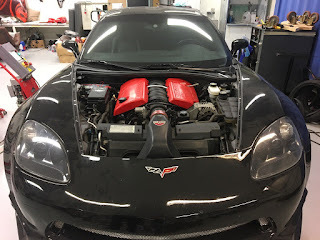 Hopefully we'll be able to show this engine at Bilsport Performance Show this Eastern. It will never the less provide a really good Smiles per Gallon ratio (yes, we've stole that...) when it hits the road! ...but is sure as hell helped a lot to solve problems with fuel supply. There was however a few drawbacks with a fuel pump shake down today. One was of them was obviously the cold wind. When back inside again in the cosy workshop with a warm cup of coffee, Carina challenged Anders and Ragnar. Who could help her with some sheet metal work? Who could make the Suffolk hubcaps look like new again? The Judge. The sheet metal fabricator Judge. Not happy yet. No verdict. What's good? What's bad? What's right and what's wrong? Who can do what's never been done? Who can win what's never been won? Well we don't know, but we know that many things has already been done and it's hard do what has never ever been done before. But this time I'm almost sure that I'm about to create a first-ever contraption. A device that if/when it starts will not produce huge amount of horsepower and not be turbocharged, but will have a 300% power increase. The adapter that enables a Honda GX120 OHV cylinder head on a Suffolk side valve engine seems to do the job. The pushrods (still needs to be fabricated) will find space where the side valves once were and the valves does fit the cylinder bore. Next step is to adjust the thickness of the adapter and the cylinder head to a suitable compression ratio. The in-between job: The Postmodern Lawnmower engine. One of its kind? If you would take any random Martian and lead this him (we assume for now, a male Martian) through the Salt Slush workshop on any Sunday, at first we would have one hell of a problem to explain what's going on in there and why people is doing what they're doing. But after a while any common sense alien would understand that it's only when you think, act and do, that the soul of a creative mind relaxes. Besides, what really makes sense if you think about it? Here's what we would have shown him last weekend. Is it the new noodle chef? Is it a tailor gone mad? No, it's Super-Anders that makes some minor adjustments to the LS engine cable harness. Why? A well working nerve system between new LS heart and Anders El Camino is essential to get old and new merge in Powerful way. In the darkness, in another part of the workshop, I was using my favorite tool, the milling machine. Why? The Chevy -36 didn't run due to fuel starvation. 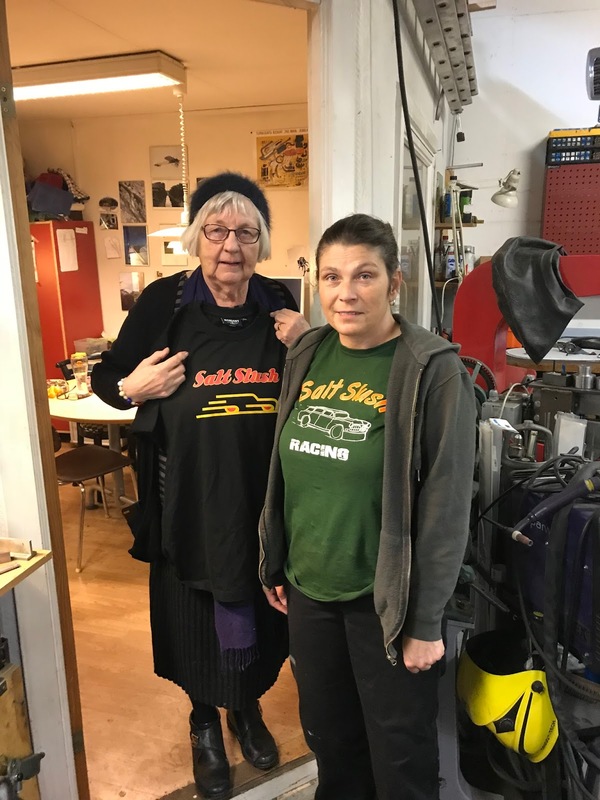 Consequence: I couldn't join Kalle's Jalopy Winter Run. Which was an epic setback. Yes, it's true, he just turned the key and drove a way as if it was his daily driver. Yes, it's turning 90 year old soon. The car, that is. But no gain without pain. Even though Kalle think of himself as a really careful and modest person, he managed to kill a steel bowl as he was flying out of the garage like a bat out of hell. Still remember our guided tour for the Man from March? Now is when we really have some explaining to do. Hang on...Carina thought that it's a good idea to build a modern Ardun V8, so we (!) started this Ardun project and we're now waiting for pistons from Ross in US. So far so good. 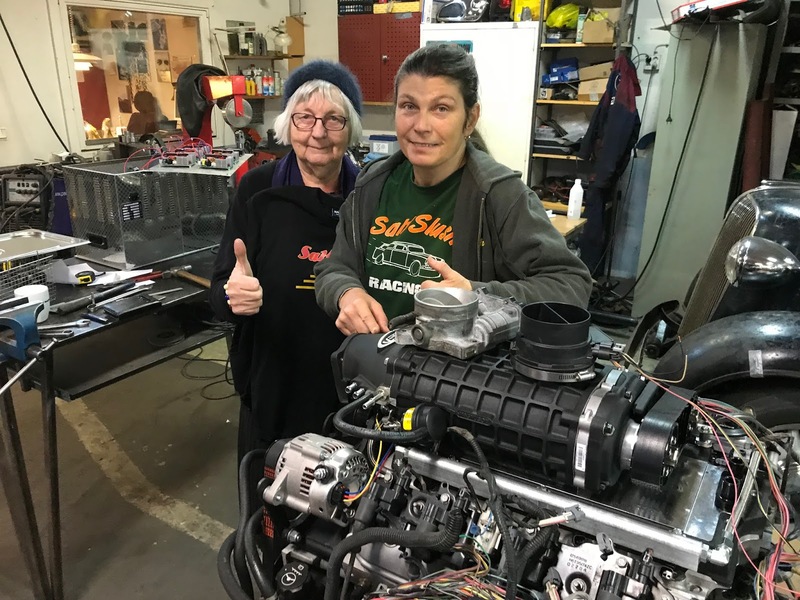 But she as well teamed up with Magnus and they came up with another brilliant idea...to practice side valve to overhead valve conversion and build a lawnmower Ardun. Suffolk lawnmower engine block and Honda GX 120 cylinder head, an Anglo-Japanese madness....here's Cina with her eBay cylinder head bargain. At this point in time our visitor would not be confused anymore. He would have reached another level and he would find no reason to explain what he have seen, because he would never go back to where he came from because he would feel at ease. In 1976 (I was 15 then) my father bougth a Ford Model A from 1928, as a father and son project. The car was in rather good condition with no rust at all, it was driveable, but in need of a restoration to make it rigth and nice to drive. So we drove it home to Gothenburg from Växjö, a town in the middle of Småland, via my Uncles farm in Hyltebruk. Here I'm in the drivers seat, close to my Uncle's farm. Fast forward, it's now 1980. 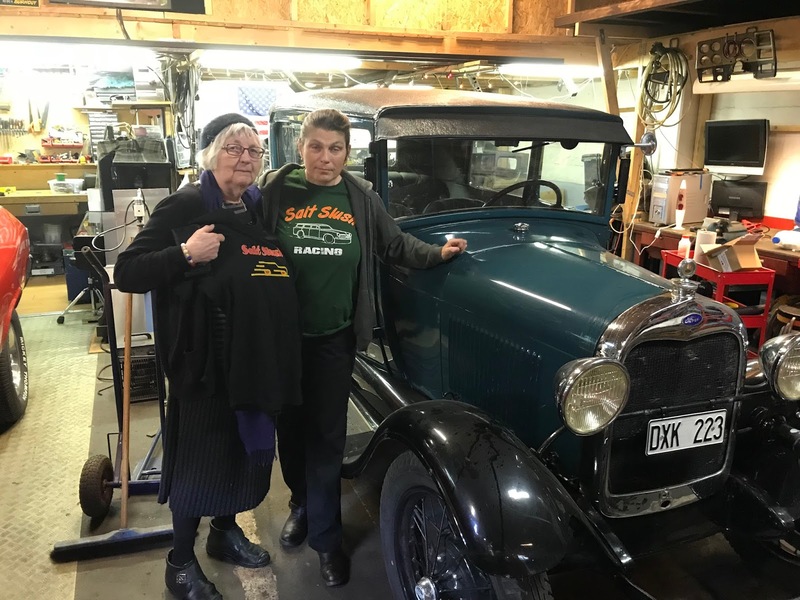 I graduated from high school and what could be better than to drive the model A to the examine together with my friends. Fast forward again. This winter (2017) the car got some TLC. I restored the front end and brakes, lights and repaired some other stuff, i.e. 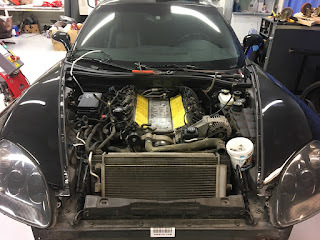 new hoses and an new engine tune (not a down load). So what could be better than celebrating this with a canon ball through Gothenburg ? 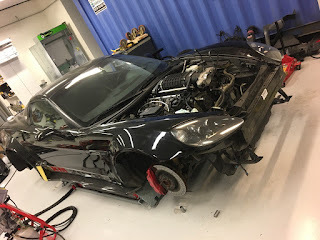 The car in the middle of TLC, still dusty. Today I took my 87 year old mother out for a drive together with Hakan and Carina. On my mothers request, he dressed up success, meaning in one of the hard to concur Salt Slush Racing T-shirts. Carina guided my mother between the different editions and T-Shirt designs. 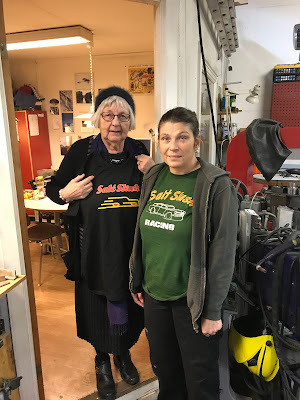 She picked the black one, a legendary design which was used at El Mirage to support our first stumbling step in land speed racing ! What could go wrong with this one? Here by the Model A before we took it out ! Since the engine sounded crisp and strong, we made some high speed pulls along Ringön...and...still healthy...felt like we could go for a spin in the cold and dry winter. The drive worked out just fine ! My Son You need one...at least ! 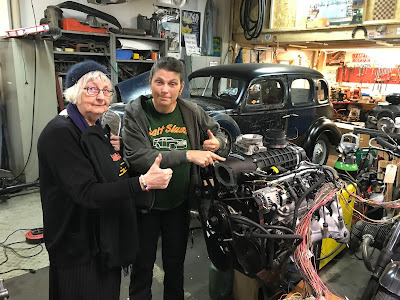 Now she is involved in a further escalation of the insanity....after evaluating the Magnuson Supercharger kit that Anders is putting on his LS She gave me a parental advice : You need at least one ! Hurry up ! So hurry up my son get your self a LS and a kit.....life is wonderful do not hesitate +600 hp a strong torque is what you need. Not in the Model A you need to put it in something else, The Model A should be as is. We didn't want to disturb, but we couldn't help being curios so we popped by to see how things progressed in Quinton's Custom Paint Studio. After a short while we realized that Quinton would not just mount the Supercharger, close his cool self made hood and hit the gas pedal. Nope. Because when some people, of the creative kind, start with something they get more ideas. I'm talking about the kind that serve as energy providers and inspiration to others. Yes, I'm talking about our customer, Quinton. 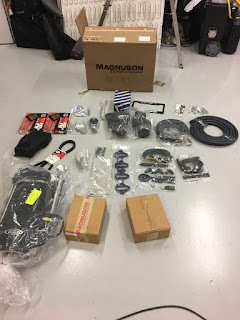 Nevertheless, at some point in time, the sun turned orange outside the studio and Quinton finally had some quality time with his Corvette and could continue with the Magnuson Supercharger installation. Late that same evening we got these pictures. Seem like he almost ready. 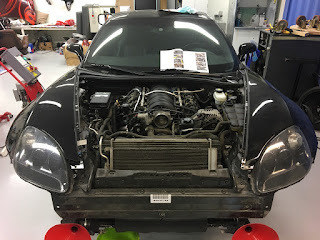 Supercharger in place. Looks good. Just add the rest, a little bit of sunshine maybe a dry road and this Black Beauty, sorry, Beast will eat up the road. 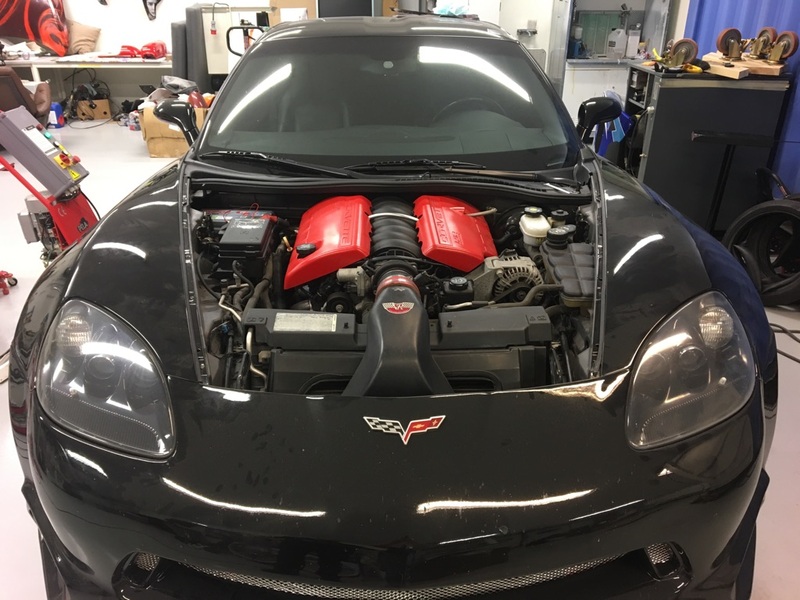 Let's assume that you're a fast guy and as well an artist, who has created an evil looking black Corvette that makes a standard C6's look like a sheep. How do you go from there? You've already in a pact with the devil, but you want to break free. You want to reach for heaven. Performance heaven. To a place where an evil look gets transformed in to a clean cut and divined performance car. Like a bat out of hell. When the moring comes. 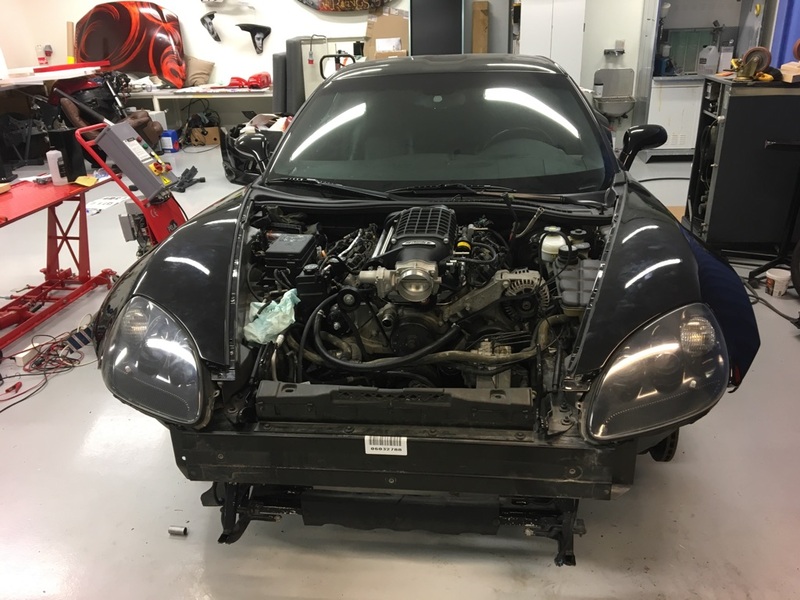 Quinton's badass C6 Corvette opens up for Power. The enabler arrives. Another Magnuson Supercharger kit is ready to serve and provide what is needed.